Whisky Live London seemed busier this year (on the Friday) but with less whisky – no sign of BBR or Glen Garioch, which were highlights for me last year, but some weird and fun stuff like Millet whisky, and some rums filled in the gaps. Also, it seems I know a lot more whisky folk than I did this time last year, and everywhere I turned there was a friendly face and a hearty handshake. 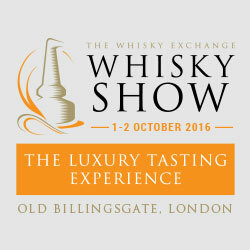 I had a blast – whisky people are extremely friendly and sometimes quite drunk. I spent a little while with Malts of Scotland/Highland Laird. These guys were distributing Malts of Scotland (a German company) in the UK and decided to create their own label. Everything I tried was interesting, and a bit funky, especially this keenly priced 19yo Tomatin. n – sweet, glazed wood, a little one dimensional. b – dark and funky with a lot of sulphur for a Tomatin, very interesting. n – a little astringent, underlying lovely fruit, ripe cooked apple and spice. b – wow – another weird one! Dusty and joss sticks. Not unpleasant but not exactly gluggable. Water brings a lot of spice. Highland Laird “His Excellency” Ben Nevis, 1970 (45yo), Blended whisky. This is one of these “last Ben Nevis blended whiskies”. Apparently malt and grain whisky from Ben Nevis distillery, together in a cask for 45 years. It looks like fanta and is less revolting than the whisky exchange one (which was just really odd and lactic as I remember). n – Sweet, gentle and highly perfumed. Like a girly cocktail. b – Gentle, slightly funky, lingering bitterness and a little spicy. Like many VERY OLD whiskies, it’s a bit of a let down, but it’s priced very keenly. Next up the geniuses at Compassbox and their 15th anniversary edition of Hedonism. The regular version is whisky around 18-20 years old, 100% first fill. Hedonism Maximus was 25-32 year old grain whisky. This new one has a big spread, some very young and very old grain whisky in it. It’ll be officially released April 15th at about £125 (although it’s already available at some sites). n – Dark, sour, almost winey, ripe pear. b – Very sweet, great structure, amazing balance, a touch of sulphur. f – Very long, extremely balanced. Now Koval, a distillery in Chicago showing some whisky made with Millet in the mash. The Millet one is 100% millet – even spicier than rye. The bourbon is 49% millet, 51% corn. n – Young, american grain, but sweet and approachable. Quite soapy but better than expected. b - Sweet, medicinal, cough candy. Balanced, quite weird, but quite good. f – Long, oily and very good. Challenging. n – Also sharp and medicinal, but with an underlying sweet vanilla corn – it lends some maturity to the spirit. b – The youth comes through a bit more here, but better rounded. Rather good! n – sweet, musky, a little ordinary, slightly metallic. b – Big, dry oloroso hit – nutty, sweet but lacking integraiton. n – Dark, young and cereal dominated. Metallic, odd seaweed and driftwood. b – hints of greatness – orchard fruit, bitter tannins, a hint of pine wood. Good balance but musky. f = Medium, spicy, some structural peat. Then some fun at Wemyss (more of them to come in the next post). n – Lovely structure, b – Sweet, balanced, works. This is the new Bowmore, just released. n – Gentle, salty, lots of ozone. b – Dark, light suplhur, again balanced but much more intense. This is very much in line with the 1987 but a bit younger and more intense. Bret rocks up, buys a DBTB dram of this and splits it with me and Steve! Cheers Bret! n – Oddly meaty, deep and dark. Beautiful and elegant. b – Spicy, oily toffee apple. This is the new peated expression from Glen Moray. n – A little sour, metallic, sour plum. Good tobacco..
b – Lovely, almost wine cask. Structured peat, bright and numbing. I also tried the 25yo port cask but my notes just read “Meh”. Everyone else seemed to be going bonkers for it though. Finally some others. Botran rum was great, as was the El Dorado range. TBWC Ledaig and Bruichladdich batch 2 were good, particularly the laddie. Then of course it all became a blur… cheers!